In last week’s episode, we went behind the scenes of GirlTalk Network with its founder Sarah Pendrick. Sarah shares how she overcame the comparison game, quit faking it on social media and stopped playing small so she could uniquely reveal her brilliance and influence. 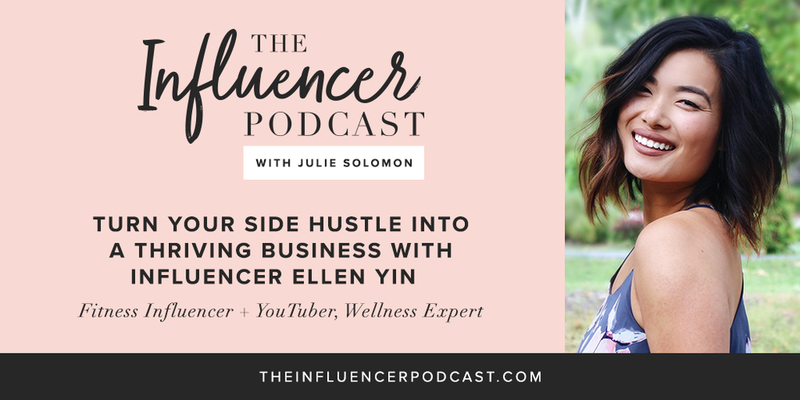 In this week’s episode, you learn how to turn your side hustle into a thriving business and strategies to differentiate yourself in a saturated market with microinfluencer and YouTuber, Ellen Yin. So happy to chat with today’s guest, as she is a student of mine! Last fall, Ellen Yin joined a course I offer called Pitch It Perfect that teaches influencers how to garner free publicity for their business and pitch themselves to brands. Ellen was new to the blogging and influencer space when she started Pitch It Perfect, and its It has been such a thrill watching her grow from what she has learned from the course as well as navigating her own brand and audience. Ellen is a fitness & lifestyle blogger for the everyday girl. Her goal is to educate women on science-based nutrition and exercise methods for reaching their fitness goals in a sustainable, healthy manner. She inspires help women find their JOY and purpose. Really excited for you guys to hear from an influencer who is “still in the trenches” so to speak and who is succeeding at making her side hustle a lucrative influencer career.